Donald Trump on Wednesday, accused President Barack Obama of founding the Islamic State of Iraq and the Levant group, ISIS. 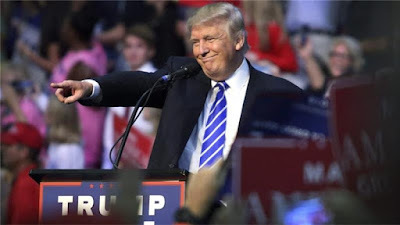 The Republican candidate emphasized the president's full legal name: Barack Hussein Obama, in the latest attack on the White House campaign trail. "In many respects, you know, they honour President Obama," Trump said during a raucous campaign rally outside Fort Lauderdale, Florida. "He is the founder of ISIS." He repeated the allegation three times. "He's the founder of ISIS, okay?" he added. "He's the founder. He founded ISIS." Trump has long blamed Obama and his former Secretary of State Hillary Clinton for pursuing Middle East policies that created a power vacuum in Iraq that was exploited by ISIL. He has sharply criticised Obama for announcing that he would pull US troops out of Iraq, a decision that many Obama critics say created the kind of instability in which groups such as ISIL thrive. "We should never have gotten out the way we got out." he added. "We unleashed terrible fury all over the Middle East. Instead of allowing some small forces behind to maybe just maybe, keep it under control, we pulled it out." The New York businessman went on to criticise Clinton, his Democratic party rival for the presidency. "And I would say, the co-founder would be crooked Hillary Clinton," he said. Trump railed at both Obama and Clinton for refusing to put a name to radical Islamic terrorism. "Our president refuses to use the term. Every time another event happens, I keep saying, I wonder if he's gonna say it this time. And he doesn't say it. And Hillary won't say it either. She doesn't want to say it cause she doesn't want to offend the president, because then bad things could happen to her if she offends the president. Bad things could happen to her. So, she's afraid to say it. Hillary is afraid to say it. She did say that she would say it because of me, but she's afraid to say it. But, we have a real problem with radical Islamic terror. It's what it is. It's terror." Whipping his supporters into a frenzy, Trump pointed out that the father of Orlando gunmen was spotted at a Clinton campaign event on Monday. "Of course he likes Clinton because she won't say the words radical Islamic terrorism," said Trump. "Wasn't it terrible when the father of the animal that killed the wonderful people in Orlando was sitting with a smile on his face right behind Hillary Clinton?" The White House refused to comment on Trump's latest claim. Trump has been criticised over the past week for comments he made suggesting gun rights advocates could stop Clinton from becoming president and picking new, anti-gun Supreme Court judges, by using their second amendment rights, which allow them to bear arms. "Hillary wants to essentially abolish the Second Amendment," Trump told a rally in North Carolina. Trump's campaign spokesman later denied allegations that the comments were advocating for Clinton to be assassinated.